Investing in the property asset class (that essential commodity called ‘shelter’) requires a long-term game plan. Ten years from now, if we were to look back and analyse which property markets throughout Australia performed the best, my money is that we will be referring to lower profile locations which took advantage of this next phase of the Asian Century – not Sydney, Melbourne and Brisbane. As large-scale urbanisation progressively unfolds across many Asian countries, structural changes continue to occur to world economies. This creates unprecedented increases in demand for different goods and services. It will keep creating exciting opportunities for businesses in key industry sectors; meaning more jobs. And, wherever there is demand for more jobs in the future there will be more demand for shelter. Enter the astute property investor – the one who plays the long game and who makes decisions with an understanding of Australia’s role in the Asian Century. They resist following the herd, instead electing to take an interest in those who are making key strategic decisions today which will lead to growth in future years (growth in the form of jobs, community confidence, and shelter). The shepherd is the one looking outside the square for these locations. I’ve held a very keen interest in the rise and rise of Asia for several years. Stage One of what is known worldwide as the Asian Century began when China commenced a period of urbanisation that became more significant than the Industrial Revolution. According to China’s National Development and Reform Commission, the percentage of China’s population living in urban areas has increased from 26 per cent in 1990 to 56 per cent in 2015. A staggering 100 million people have migrated from a rural area to an urban city over the last five years; brand new cities the size of Brisbane were built within twelve months. The increased demand for steel (iron ore and coking coal) and electricity (gas and thermal coal) is enormous and, with some of the biggest reserves of natural resources in the world, Australia played a key role. FACT: a very large majority of Australia’s best performed property markets across the first 15 years since the turn of the century were in locations with economies linked to natural resources. The unprecedented demand for natural resources in Western Australia, Queensland and Norther Territory resulted in tens of thousands of capital city white collar jobs servicing numerous projects in their respective regions. This played a significant role in the property markets of Darwin (9.7 per cent), Perth (9.6 per cent), and Brisbane (8.8 per cent) producing average annual changes in median house values which were higher than Sydney (7.2 per cent) and Melbourne (8.3 per cent) across the 15 years since the turn of the century. Numerous regional locations performed even better over the same period, not to mention the higher rental yields. And, no, I’m not just referring to one-industry mining towns. There are numerous multi-industry regional cities (mini capital cities with all of the essential infrastructure) which also outperformed capital cities. Whereas Stage One of the Asian Century was all about natural resources to build new urban cities in China, Stage Two is more about the intense demand for goods and services from the hundreds of millions of former rural peasants who are now living a middle class lifestyle which the rest of developed world has long taken for granted. It’s not all about China – India (population 1.33 billion) is touted as the next major country to transition through a similar period of unprecedented urbanisation. Stage Two also includes improved engagement with already developed countries like Japan, South Korea, Singapore and Malaysia. According to the OECD, Asia’s middle class is forecast to grow from 0.5 billion (in 2009) to 1.5 billion by 2020. To put this in to perspective, Australia’s total population is 0.02 billion. An Asian Century research project which Propertyology conducted back in 2012 drew us to the conclusion that Australia’s tourism industry had potential for an era of growth and prosperity which would exceed the lofty heights that the mining industry saw. Overseas arrivals to Australia subsequently increased from 2.82 million people over the 6 months to June 2012 to 3.88 million over the same period 4 years later and the sharp, northward trajectory looks like continuing. The retail trade and accommodation sectors together have created 131,761 (22 per cent) out of Australia’s 584,821 extra jobs over these four years. For the year ending June 2016, international visitors spent a record $38.1 billion and tourism grew three times faster than Australia’s broader economy. It is no coincidence that Australia’s two biggest tourism destinations for overseas visitors – Sydney and Melbourne – were our strongest property markets during the period 2013 to 2015. Other popular lifestyle markets which have also picked up include Gold Coast, Cairns, NSW Central Coast, Dubbo, Hobart and Byron Bay. On an all-things-being-equal basis, locations with strong performing tourism economies have potential to be above-average property market performers because tourism is such a labour intensive industry (17 per cent of Australia’s workforce are in the retail and accommodation sectors). But, investors would be wise to be more open minded than limiting their focus to Australia’s 3 biggest cities. Private and public investment is underway all over the country in new resorts, hotels, and attractions. Recent airport and cruise ship expansions have also improved access to some locations. Locations which Propertyology expect to benefit from a long, prosperous tourism era include Cairns, Townsville, Hervey Bay, Gold and Sunshine Coast, Toowoomba, Scenic Rim, Darwin, Katherine, Hobart, Devonport, Burnie, Launceston, Busselton, Geraldton, Dubbo, Tamworth, Byron Bay, and Ballarat. In addition to tourism, other Australian industry sectors which have experienced good growth over the last 3 or 4 years include the international student market, segments within our agriculture industry, and advanced manufacturing. The federal government has devoted an entire White Paper to investigating opportunities for Australia in the Asian Century. Due to a combination of its close proximity to Asian countries and an abundance of rich agricultural land, above-average rainfall, natural resources, and unique tourism experiences, enormous potential exists across northern Australia. To tap in to this enormous opportunity, the federal government is dangling a $5 billion carrot to encourage private sector investment in infrastructure such as dams, airports, ports, and rail freight corridors. Headquarters for the Northern Australia Infrastructure Fund officially opened in Cairns in July 2016. From the west coast to the east, every location above the Tropic of Capricorn is in play and it’s only a matter of time before we hear announcements about economic development and major job creating projects. Arguably the most significant legacy left by former Prime Minister, Tony Abbott, was the signing of three separate Free Trade Agreements (FTAs) during a 12 month period ending December 2015. With a combined population of 1.5 billion people, Japan, South Korea and China can now import a wide range of Australian products which attract substantially reduced tariffs (taxes). Products with the highest potential for increased demand include proteins (the likes of beef, lamb, salmon, milk, cheese) and premium quality alcoholic beverages. While the ink is still drying on these FTAs, industry stakeholders such as farmers, food manufacturers, and freight logistic companies have already begun exploring how they can tap in to these lucrative markets. 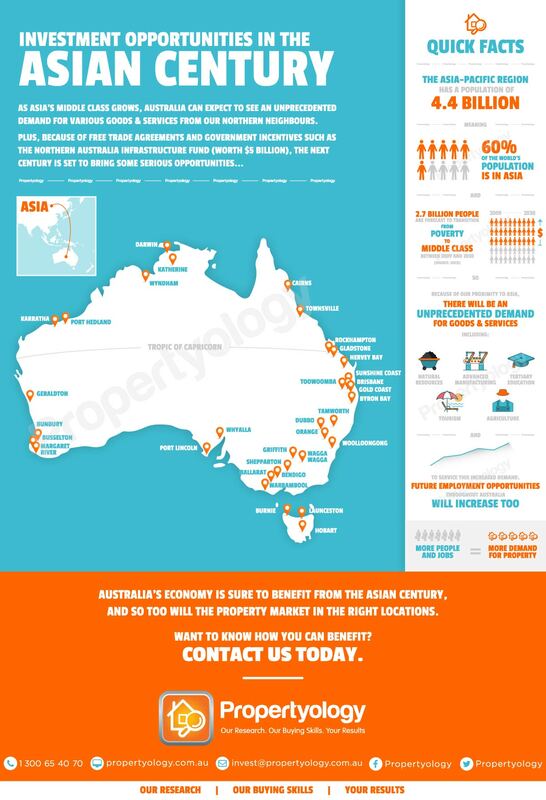 From a property investment perspective, key regions which are on Propertyology’s radar include Queensland’s Darling Downs, Capricornia, Far North, and Flinders region, Western Australia’s Margaret River and Bunbury, New South Wales regions of Orana, Riverina and Northern Inland, Victoria’s Great South Coast and Goulburn Valley, Tasmania, the Barossa in South Australia, and Northern Territory’s Katherine. Australia is set to increasingly be popular to Asia’s rising middle class for our tertiary education services. Melbourne already leads the way as an international student export market. Brisbane City Council has recently attracted extra investment in new accommodation facilities for international students. In August, University of Adelaide announced a $100 million project while Perth’s Murdoch precinct also has scope. Strong regional locations such as Orange, Dubbo, Wollongong, Townsville, Cairns, Hervey Bay and Launceston have potential to become a future breeding ground for Asian professionals. Hobart is already affectionately known as a ‘university city’. And, those who have written mining off might want to think again. Currently, approximately 700 million out of China’s 1.38 billion population currently live in cities. Australian mining giant, Fortescue Metals, recently reported that they predict an additional 300 million Chinese people will complete their transition in to city living by 2030. To put this in to context, since the arrival of the First Fleet in Australia 228 years ago, our eight capital cities have grown to now accommodate 15.5 million people. China alone are predicted to build 12 modern countries the size of Australia in just 14 years. The Asian Century is a mere 16 years young!